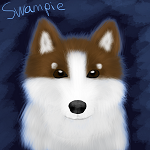 About Me: Swampie from Norway here. Owner of Lissi the Beagle and Luna the Halden Hound :) I love competitions and breeding dogs, that is my (future) lifestyle in real life too, so this game is perfect for me! :) See about page!